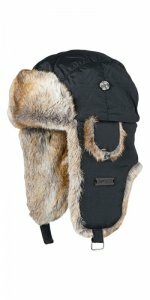 I have to say while I like this hat the velcro chin strap is not the best and seems a little pathetic for adjustment but will stop the hat from detaching while skiing or boarding at speed, but this is one hat that you can affect the size of the fit from the rear. It is also looking more waterproof than other high street types for this stylish hat. But having said that it is twice the price. So have yet to try on the slopes.